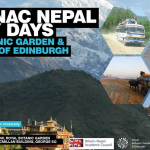 The 10th Annual BNAC lecture will be held on Friday, 19 October, 2012, at 6.30pm in Room NAB.1.04 in the New Academic Building, London School of Economics, 54 Lincolns Inn Fields, London WC2A 3LJ. The lecture is entitled ‘The Protection of Himalayan Biodiversity: Why a Regional Legal Framework?’ and will be delivered by Dr Ananda Mohan Bhattarai, who currently works as a judge in the Court of Appeal of Nepal. Click here to download a PDF with more information.